Needing the versatility and strength of copper braid for your business’ next endeavors? As a premier supplier of quality copper braid, specialty wire and cable we make it easy to purchase what you need and how you need it! Braided wire is a useful structure that can be provided rolled flat or in tubular form. Flat braids are generally seen used for flexible connections, electrical leads and grounding straps while tubular braids are basically used as shielding around other cables. Put Ups: We offer standard put ups in 100 feet, 250 feet, 500 feet and 1,000 feet. Alloys: We carry many different varieties of copper braided cable. We can fabricate copper braid from bare copper wire, tinned copper, nickel plated copper, silver plated copper cable, stainless steel, nickel wire and other materials. Braided Wire Shapes: We can provide copper braided wire it in both rolled flat and tubular form. Special Sizes and Put Ups: We are able to supply braided wire and put ups on request. Just contact us and we’ll be happy to find a solution for your project! Tubular braids are constructed to produce a braid matching approximate awg size and ampacity. the braid is then mill rolled for a specific width and thickness. They can be used as flexible grounding strap. Their main characteristic the ability to handle large current at low voltages. UPB1/2 UQB1/2 1 l 2 .035 36 43 8 384 10 9 0U 53.0 39. Copper braid finds use in many different forms and components due to its strength, flexibility and superior ability to handle large currents at low voltages. 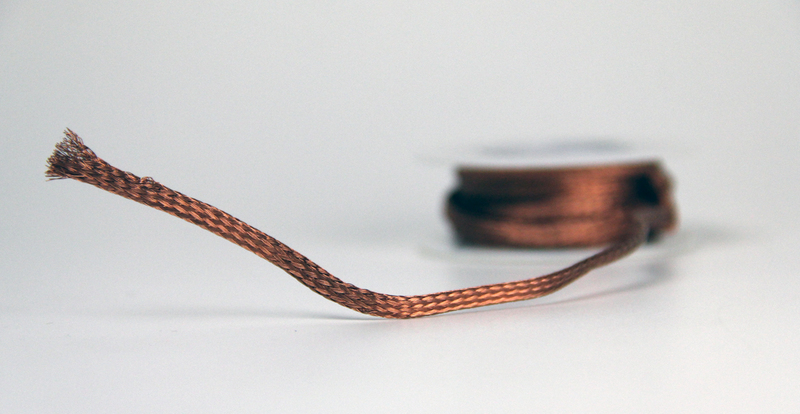 This makes copper braided wire a perfect choice as a flexible grounding strap when rolled flat. Due to the nature of the copper braided cable, it also makes it a popular choice for shielding in its tubular form. The primary and most versatile use of copper braid sees it made into shielding for many of the cables we use on a daily basis in communications and other industries. For instance, coaxial cables, one of the most popular cables for cable T.V. and satellite, makes use of copper braided wire to protect it from external wear and tear as well as outside interference. Copper braid is also a primary component for twisted pair cables. These useful cables, created in 1881, are one of the most popular choices for network cable in short and medium ranges (up to 100 meters.) Given the lower costs compared to optical fiber and coaxial cable, these are a great choice for the networking applications of small businesses. At Arcor Electronics we specialize in creating the braided wire needed for your business or project. To inquire about pricing, specific sizes and design specifications of your copper braided wire needs, you can contact Arcor or get in touch with us by phone at (847) 588-0088.